Volvo CEO Hakan Samuelsson is proud that the XC90 touchscreen control panel has helped reduce the number of buttons in the crossover. BIRMINGHAM, England -- Volvo will make less complexity a selling point against its German premium rivals, CEO Hakan Samuelsson said. He used three numbers -- 55, 37 and eight -- to make his point. The numerals 55 and 37 represent the number of buttons available in recently launched models from two of the three German luxury brands BMW, Audi and Mercedes-Benz. Eight represents the number of buttons needed to control the main functions in the new Volvo XC90. “No one wants buttons hidden down in the dark areas around the seats,” Samuelsson told the Automotive News Europe Congress here on Wednesday. His point was that Volvo would not try to match its rivals because it has a newfound confidence in itself and what it has to offer. “No one wants to buy a copy. They buy the original,” he said. Another original idea Samuelsson mentioned during his presentation was an app-based service that allows a Volvo owner to get groceries or dry cleaning delivered to their parked vehicle. The delivery person is given one-time access to the car to drop off the items. They then shut and lock the car and send the Volvo owner a text message informing them the items have been delivered. The examples are part of Volvo's efforts to re-invent the brand, which was bought from Ford Motor Co. by China's Zhejiang Geely Holding Group Co. in 2010. At that time Volvo had very little new product and was reliant on Ford for its platforms and engines. Starting with the new-generation XC90, which is arriving at dealerships in Europe this month, and will be in U.S. showrooms in July, the automaker's engines and platforms will be 100 percent Volvo. 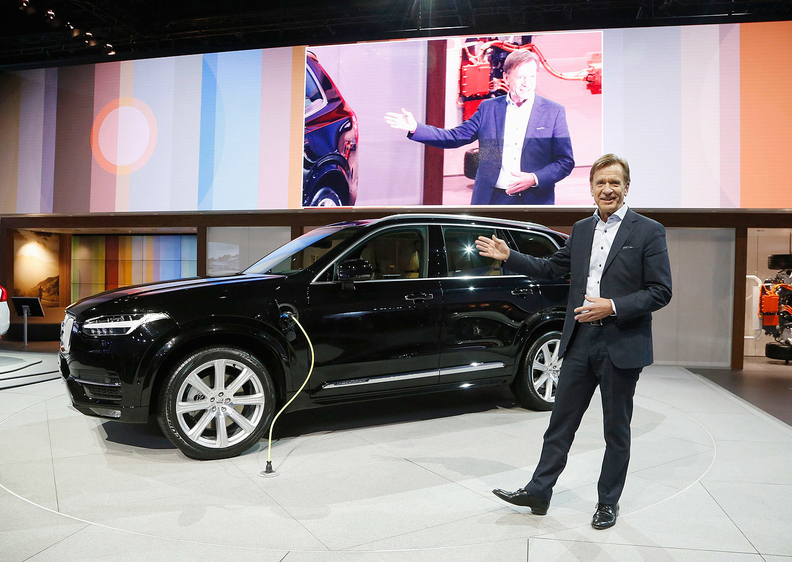 Samuelsson said that in four years the XC90 will be the oldest model in the brand's lineup as the result of its aggressive product offensive that Volvo hopes will increase global sales to 800,000 by 2020 from 465,866 last year and a targeted 500,000 this year. When asked whether Volvo's chief target was Audi, BMW or Mercedes as it chases its 2020 goal Samuelsson said that the focus was on reaching customers who are less interested in horsepower and more focused on showing that they take responsibility for the environment and their family.